Handy collection of record sheets for your ships as well as your characters. Publisher's blurb: "Prepare to explore the final frontier with these Star Trek Adventures character sheets, FREE for you to download which now feature form fillable versions. 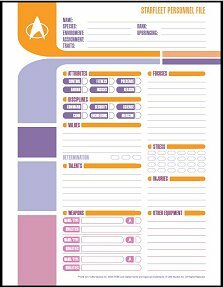 Includes: a sample character sheet which lets you record your character's species, attributes, talents, specialities and skills in the Next Generation style; an Original Series style layout and starship registry entries, which chronicle the characteristics of your Starfleet vessels, including systems, power, weapons, designation and space frame. An ample helping of character sheet goodness, to help you live long and prosper in Star Trek Adventures."